Global organisations must be responsive to market realities to drive performance, whether those realities are new government regulations, healthcare reform, business model shifts, or industry upswings and downturns. Businesses achieve competitive differentiation through simplicity and consistency across the organisation while creating a culture of engagement and performance. By arming managers with tools that offer real-time insight for unprecedented visibility into the workforce, organisations can now ensure alignment to the most important initiatives and be agile enough to readily absorb and adapt to external shocks. 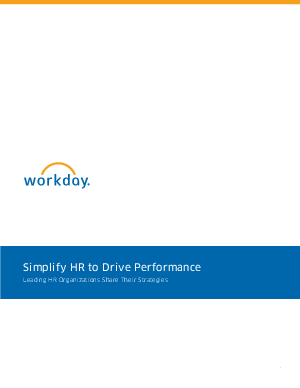 Download now to find out how Workday customers are taking steps to proactively prepare for these inevitabilities.